The 1930s were a great time for prison dramas. Films such as 20,000 Years in Sing Sing (1932), The Big House (1930) and I Am a Fugitive from a Chain Gang (1932) graced the screens satisfying the taste buds of movie-goers who wanted a taste of the clink. 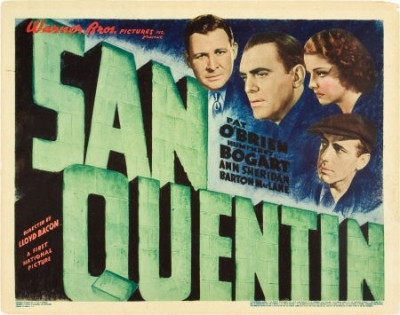 San Quentin (1937) is exactly what you'd expect out of a prison drama with the added benefit of a love story and the presence of Humphrey Bogart. San Quentin is an unruly prison with issues. The prisoners have been lashing out at captain Druggin (Barton McLane) whose been giving them extra doses of punishment to satisfy his own selfish desires. With mutiny imminent, the prison needs to bring order to this unruly crowd. Whom better to bring order to chaos than someone from the most disciplined service there is: the army. Captain Jameson (Pat O'Brien) is hired for the gig but on the eve of his first day on the job he swoons for lounge singer May (Ann Sheridan). Trouble is, May is the sister of Red Kennedy (Humphrey Bogart), San Quentin's newest prisoner. I enjoyed how the love story complicated the prison story. And how the story dipped out into the real world ever so often. It made me want to stay in the real world more and the prison world less. And isn't that how I'm supposed to feel? Trivia: Humphrey Bogart's character Red Kennedy is described as 5'10" in the film. This turned on a dusty lightbulb in my brain and I declared to an empty room "no he's not!". If you'll recall my previous post about Leading Men shorter than Richard Widmark, Bogie was actually 5'8". Ha! verification word: zatablob - like Steve mcQueen might have said " zatablob over there?" Enjoying your Bogie marathon! I saw this film a while ago and enjoyed his performance, but I did keep wondering if the part had been written with Cagney in mind, as it somehow seems a lot like his sort of role, and also it sounds as if the character is supposed to be an Irish redhead (not that you can tell in black and white!) Anyway Bogart does a fine job, though I can't quite believe in him as Ann Sheridan's younger brother.